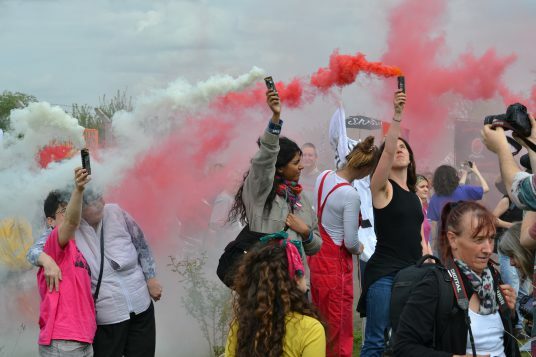 Women for Refugee Women organised a coach on the 13th May to take refugee women from our network to join a protest organised by Movement For Justice By Any Means Necessary at Yarl’s Wood immigration detention centre in Bedfordshire. After a two-hour journey, we arrived at the industrial estate which Yarl’s Wood is hidden behind, and joined other protesters from all over the UK. The atmosphere was one of hope and solidarity with the women who are still held in detention. The protest came just a few days after one of the longest-held detainees was released. 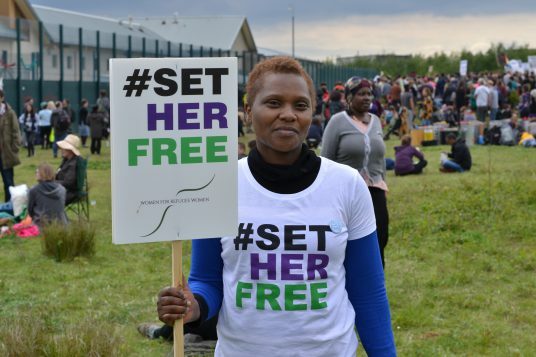 Mabel Gawanas, speaking after almost 3 years in detention, reminded the crowds how important it is for detention to end, stating that women are “slowly dying” in Yarl’s Wood. We marched along the fence of Yarl’s Wood to chants of “Shut it down”, “Fight back” and “No human is illegal”. We stopped once we had come to the back of the building where detainees could see us through their bedroom windows, waving and carrying their own signs, some of which read “SAVE US”. Protestors began kicking the high metal fence that separated us from the women inside, making as much noise as possible so the women could hear us. Drums and music were played throughout, with people dancing and singing. Smoke bombs were lit, adding colour to the otherwise monotonous and stale environment that is Yarl’s Wood. Even children were protesting detention, one shouting softly to “Shut it down”. Many of the women we had come with had been held in detention themselves. When asked why she came to protest Esther stated, “I protested today to fight for the freedom of women who are detained, to fight for their rights, to fight for hope. I was detained once and it was not easy. I became mentally disturbed. I don’t want detention to exist because I have experience of it. Detention must stop”. One woman who was also held in detention and said that, “I was detained and, even now, I don’t know where I will be tomorrow. I have two children, one of them with cerebral palsy. I am refused asylum again and again. I try and try, but I am still turned down all the time. Maybe one day I will be back in detention but I do not want to go back to that prison. There is no freedom for so many women in detention”. When we asked Rehemah why she came to protest she made the sobering statement of, “We want to send the message that whatever brought a detainee to this country was not a crime, it was asylum”. By looking at Yarl’s Wood, surrounded by high fences, with windows that only opened enough for a hand to wave out of, it was clear that the line between detention centre and prison is a fine one. Many women in detention feel like they are being treated as a criminal, their only crime being seeking safety. “We can hear you and we can see you, what do you want to say?” With a unified shout that defied fear, the women inside cried, “Freedom”. Hannah Bondi is a Communications Intern with Women for Refugee Women and full-time student at King’s College London. She is also interning with the European Network of Migrant Women.